time, energy, and money on a regular basis. While you are thinking about the nutritional benefits of frozen foods such as vegetables and fruits, and the timesaving benefits of preparing and storing freezer meals for your elderly loved one, you should also turn your thoughts to how you can help your senior to use these foods most effectively. This includes keeping your parent’s freezer clean and organized. A properly cleaned, organized freezer prevents your parent from wasting food due to not eating it within an appropriate time or not storing it properly or potentially getting ill from eating spoiled or improperly stored foods. It also helps them to be able to handle more of their own meal preparation and gives them access to a healthier, more varied assortment of meals so they can enjoy better nutrition and the mental and emotional health benefits of simple cooking. Consider a vacuum sealer. Investing in a vacuum sealer can help your parent save a considerable amount of time and money. These sealers allow you to purchase food in bulk and store it safely for later use. The clear packages make it easy for you to determine what is in each container, and many are heat-resistant so that you can even heat up foods right in the bag. Freeze in portions. Maximize the food that you prepare and help further simplify meal preparation and serving by freezing foods in individual portions. If you are freezing something such as sauce or fruit that only needs a small serving, but want to reduce the number of bags you are using, employ chopsticks to help divide then up. Fill a freezer bag with the food and lay it flat on a cookie sheets. Settle chopsticks into place on the bag to differentiate the individual servings, pushing them down to separate the food, and carefully transfer the cookie sheet into the freezer. After a few hours, remove the chopsticks and allow to freeze completely before removing the cookie sheet and stacking the food in the freezer. This way when your parent wants to use the particular food, all they need to do is open the bag, remove one frozen serving, and return the rest to the freezer. Label everything. Be sure to label everything that you put into the freezer that is not readily obvious what it is. The label should include what the food is, when it was frozen, and how to prepare it. This makes selecting and preparing meals faster and easier. 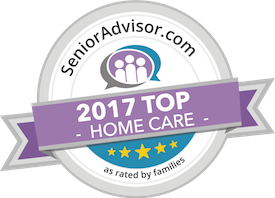 Starting home care for your elderly loved one can be one of the most nurturing, compassionate, and effective decisions that you can make for them throughout the course of your caregiver journey with them. This in-home senior care services provider can be with your elderly loved one on a customized schedule designed to ensure that their individual needs, challenges, and limitations are managed in the way that is right for them, while also encouraging them to pursue a lifestyle that is active, engaged, and as independent as possible. While this can include handling physical needs such as assisting with mobility, bathing, toileting, and meal preparation, this care can also be valuable for supporting a high quality of life as your parent ages in place. This can include helping them keep their home clean, organized, and accessible so that they can remain comfortable, safe, and healthy throughout their later years. Have questions about home care in Oahu, HI? Contact the caring staff at All Care Hawaii today. Call Oahu (808) 206-8409 or Maui (808) 664-3853. Call us 24 hours a day, 7 days a week!